Every travel agent knows about selling travel insurance and many do actually know the fine print and others shy away from even mentioning it to their clients. This product is in fact the first item on your checklist of things to discuss with your clients once the initial meet and greet chit chat about where your clients want to go is over. With the recent buzz about the safety of cruising and the media attention paid to the new safety regulation upgrades, the new era for selling travel insurance has begun. Just make sure you are at the fore front of this new surge. 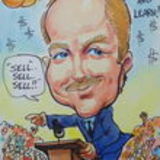 Don’t forget, if you need help with anything you read in Selling Travel I am as close as your email or Skype button. There is one thing for sure – you do not, ever want to see a customer walking into your agency with their lawyer. It will happen if you do not follow the rules of engagement when selling travel to your regular and newly found customers. Travel insurance is not an add‐on product. It is not an “oh… did I tell you about…” product. It is one of the most important components of every sale you make. If you attended my Travel Insurance – Travel Safety Niche webinar you would have made a note‐to‐self that “from this moment on”, no client leaves your office without being fully protected from almost anything that might befall them – including themselves. That’s right. Many times the enemy is within. As you read this issue of Selling Travel start to think about how you will support the sale of travel insurance by mentioning and offering safety advice in your everyday meet & greet. There is a whole new niche here, plus more commissions than you can imagine PLUS you’ll get to stay out of court if a client challenges you that they did not receive the correct advice and were never told about protecting themselves with insurance. Don’t leave it to chance. Be the travel insurance specialist you should be and turn your knowledge into a new niche for your agency. Let’s go make something happen! Let me know what you need! Creatively Yours! Another thing you never want to experience is your very own Mother arriving to visit you and being trundled out of the airport arrivals area on a gurney! I did. My Mum and Dad came for a visit from the UK and Mum had a heart attack an hour before landing. Fast forward – they did have travel insurance and after 10 days in the hospital and some $40,000 later they flew home. The insurance saved them and it saved my wife and I too. Be sure to protect every client from here on. Make insurance mandatory. What’s the closing success of your frontline sales team when selling travel insurance to your regular clients, referrals, newly acquired clients, groups, corporate accounts and those clients who are the one‐shot booking? Is your answer a 100% close ratio? Can I get 80? The truth of the matter is this. Generally the close ratio is 30%. It goes up according to the relationship with the client. If the client is a long term customer, they are well travelled, they trust you and they already know the benefits of buying travel insurance coverage. When these clients are buying travel the close ratio on selling travel insurance to them, is or should be 100%. Now we need to work on everyone else. Coaching your frontline to start and finish with the mention of travel insurance is not that difficult. It might take extra effort on your part to manage and monitor what they say and how they present the product, however there is always the weekly staff meeting. You can ask someone to present their closing technique. You can also use this weekly meeting to present an insurance sale challenge and let someone take it on and solve it there and then. You can be the customer, set the challenge and let one of your frontline do their best to close you. After each session you can debrief with a “how did we do?” question and then explore what could have been said or done to close that sale. Coaching is at it’s best when there is action and activity and the people being coached are doing and performing, in this case, the sales technique. From the debrief usually comes more ideas. It’s sometimes difficult to think on your feet. Many of us prefer a build‐up to the action versus, “Okay Steve, you’re up!” So give this some thought and make it work for the different personalities of your team. You want to encourage them not embarrass them. 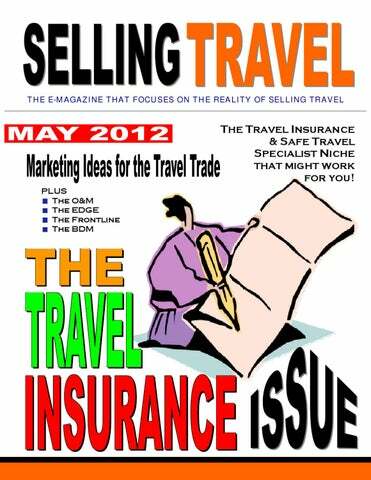 Get sold on selling travel insurance yourself and then you can sell your team on the idea too. Promote the product in your agency window, front and center on your website, study SOS apps for mobile phones and learn a little more about travelling safely. This information will help you better advise your team to better advise their clients about how they can take control of their personal safety when on the road, in the air, staying at a hotel or resort and walking around local areas. The Costa Concordia event is all you need to help you sell more insurance. Since that event we’ve had terrible storms, plane crashes, hotel fires and more mishaps on that big blue ocean. The odds are in your favour to protect your client with travel insurance and sound safety advice too. YOU ARE THE LINK TO YOUR Being a professional travel counsellor in the present world of travel means that you simply must be way ahead of the game when it comes to selling travel insurance. Offering safe travel advice to your clients, too. This might be a little unnerving to some readers, however this is the role you have taken on. Let’s get you onside to make is easier for you to tell and sell and protect your clients. If you have not yet experienced a problem when travelling, it’s hard to put yourself in the position of someone who is overseas, in a location where English for instance is not spoken, who has a severe stomach ache and looking for a doctor. Fast forward to technology, websites, links, applications and that same traveller could have, if they knew about it, made contact with a company like ON CALL. Since the Concordia sinking there has been many more accidents that did not make the mass media other than a surface report. There have been air disasters, hotel fires, ferries sinking and massive destruction through storms and hurricanes. Then we have the continuation of terrorist attacks too. The world is great place to travel and even better if you know how to stay safe. You would know to advise your clients not to follow the crowd wouldn’t you? A crowd today isn’t going to a local wedding, it’s going to demonstrate in the city square and that means tear gas and rubber bullets. Your role in this day and age is to make sure your clients are fully informed and fully protected through travel insurance. You may not be able to established yourself as a Travel Insurance and Travel Safety Specialist, however you can certainly follow the company sales plan and make sure no one leaves your desk without purchasing full and complete coverage. If you are not convinced about the power of insurance I’ll guide you to spend a hour or two watching YouTube videos. Just type in auto accidents, cruise ship disasters or huge waves. Then go to hotel fires and if that’s not enough go to railway crashes. That should just about do it. After that hour you will have enough graphic content in your head to help you persuade your clients that you want them fully insured before leaving your office. I’m an advocate of selling insurance as you can tell and that’s always been the case from my days on the frontline to now when I travel on business. I’m covered. So learn the scripts. Practice with your owner / manager and become the best at protecting you clients so that they live long and prosper and come back to book again! This is an opportunity that few can jump on. The reason being, anyone other than a self‐employed independent contractor can’t make a fast decision. You don’t need to go upstairs to get the approval to go ahead. You can decide right now. What I am talking about here is the opportunity for you to open up an online store to sell travel safety gadgets, gizmos, devices and applications. You can add this e‐store to your existing website and or create another website or, go to another level and open a shopping cart enabled website like the one shown below. There are hundreds to choose from. So check locally for the best pricing and options. Make sure you have a PayPal account before you make contact. I’m looking for real‐time challenges that stop you from being the best you can be. Be sure to include your email and website links. Thanks! The American Red Cross has all sorts of safety devices and they would be sold by all Red Cross outlets around the world so be sure to check for them. Below is a store called Jet‐Setter and they offer a variety of travel gadgets that include more than safety and security devices. Stores like this usually run an affiliate program – which means you just have to link to them and you’ll receive a commission based on click‐through sales from your website. So there you go. Home based e‐store selling safe travel gadgets for extra income and additional travel insurance sales. Keep your client’s safe and keep that database safe too. Safe travel starts from the inside out. Cory be Nimble, Cory be quick… read on! Creating customers for life is a cliché that has been around for a long time…. Probably because it makes good business sense and sustains great businesses for years. BUT, you ask…”How do you create, manage and utilize so many relationships with so many contacts, online and off, from so many different places these days?” Good question! I found a FREE business social media website and CRM (Customer Relationship Management) tool that easily manages all my contacts, email communications, SOCIAL activities, and soon to be sales in one single place… Let me introduce you to http://www.nimble.com I like this tool for many reasons and wanted to share them with you here. WHY an online database you ask? Well, with so many online contacts being generated, maintained and then utilized in a proactive social manner, it seems natural to use an online tool that brings it altogether, in one place. HERE’S WHAT YOU CAN DO #1. Follow conversations easily from key contacts, suppliers, colleagues, prospects, and customers in a variety of different ways, views, threads. #2. Enjoy a macro view of all social channels in one glance. #3. Store and protect such multiple conversations. #4. Easily synchronize email from personal and professional accounts to respond sooner. So many more practical applications, but you need to get started on your own. Review the site for yourself and check out the many reasons why you should log‐on for free and download the tour video to get started. By uploading your social contacts into one online application, you easily protect your contacts online and efficiently manage their effectiveness on a daily basis. Are you the one? Are you the travel agent in your area who “get’s it”? The one who realizes that the product that should be number one on your hit list and the product that pays the most commission is travel insurance? Are you the travel agent who senses that few of your competitors have the desire to enter the world of becoming a Travel Insurance Sales Professional? If this is YOU then you are about to make some serious coin! Walk the beat and check out how many travel agency windows are pushing travel insurance. Not too many I bet. Now that’s a good thing for you and a sad thing for them and also for their clients. Selling, marketing, pushing, mentioning, suggesting, nudging and talking about travel insurance coverage is a serious business and that’s the bit I want to stress. Travel insurance is all about business and it’s also about keeping your clients relaxed when they travel and this comes about through their peace of mind – one of the benefits of purchasing complete coverage from you. When you combine your travel insurance advice with your knowledge of how to travel safely then your client will be in awe of your professional status as a travel insurance specialist. You will have a specialty that few if any travel agents in your area have explored. Going Beyond The Normal Travel Insurance Training Selling travel insurance does require that you learn all the sales techniques especially when it comes to qualifying and answering those pesky questions that start with “Why…?” Followed by “What if…?” You know the questions I’m talking about – the questions that force some travel agents to give up and reach for the waiver. Not you. As a travel insurance sales professional you want these questions to be asked. You like the challenge and understand that each question uncovers the client’s real concerns and their needs. These questions are nothing to worry about when you know your product well – and that there is the dividing line. The true pro’ would have asked their travel insurance provider to train them above and beyond the typical and usual agent training. The training you’ll want is equivalent to what the BDM receives as an employee. Of course in a tight spot your preferred insurance supplier has a team of people to support you and answer the deeper, wider, could go either way question. You’ll ask to meet this team. Be introduced. Have a chat. Build that all important relationship. This support team is the professional’s life line. Imagine knowing all the small print. What it says, what it does. This level of knowledge builds supreme confidence. It allows you to stand head & shoulders above your competition. It gives you a new claim to market. It puts you in the spot light. Your new niche will attract more business too. Talking Up The Results Of Not Purchasing Insurance Since the Costa Concordia event and the consumer content that went viral, travel safety is one hot topic. Some suppliers have downplayed it and some cruise BDMs texting during a post Concordia webinar stated, they did not expect their passengers to bring their lifejacket to muster as they usually tripped over the straps! Since then the rules have changed. You can ride on every accident in history and those about to happen too. As a travel insurance professional you do not shy away from these tragedies you use them, exploit them in order to knock some sense into those clients who just don’t get it. The fact that a family is going on vacation and the children are not protected drives me nuts! Yet it happens every day and so many travel agents allow it to happen. But not you. That’s right. You will challenge their decision not to protect their children. Fear mongering in this instance is a good thing. Sure you might be called out by some righteous group. But then any repercussions of your clients not being pushed to buy insurance will not cause them loss of sleep. They like to grandstand – you like your clients to travel fully covered, well insured. Lives are at risk in todays wonderful world of travel. Travel has always been risky but today we have a few extra things to be aware of. The next page will help you understand what you need to know about travel safety. Have you ever hit turbulence, survived a near miss, experienced a hotel evacuation? How about stubbed your toe, slipped on a slippery floor or rain soaked rocks or been caught off guard by a big wave? If you travel, chances are the answer is yes. So, you’ll know from experience, accidents do happen and they happen all the time. To you and your clients, at home and when you travel. That’s life. It’s a fact. Knowing this to be true, that accidents do and will happen, many of your clients still argue that nothing will ever happen to them – and most of the time, perhaps not you, but so many other travel agents allow their clients to travel unprotected. If the generic close ratio is around 30% that means 70% of your clients are going to all points on the compass without a safe travel plan. As a travel insurance professional you must tie the two together – the “two” would be travel safety advice and travel insurance coverage. You should also take a stand and not allow your clients to cajole you into letting them travel without purchasing insurance and raising the fact that accidents do happen can help persuade them to do the right thing. We know that car accidents are the greatest cause of injury and death to all tourists. Doesn’t matter where you are from, if you are driving or in someone else’s car or sat a tourist coach somewhere ‐ your chances of having an accident just went off the radar. You cannot control everything. It’s not within your power. Your client might just be in the wrong car, at the wrong time, in the wrong place… it’s fate, it’s just unlucky. What you can help to control is the post accident outcome. The accident has happened – your client is whisked away to hospital… so now what? No insurance coverage = a tough time. Covered = instant medical response and survival. The Survival Store Here is an opportunity to generate a new revenue stream and it’s done by selling small, pocket sized survival gear. Let me set you up once again as the travel insurance and travel safety expert in your area. To complete this niche you can sell these gadgets. Would you believe that a small $1.99 whistle could save a life? Crazy isn’t it – just a $1.99 is all that lies between life and death. Now ask yourself how many of your clients carry a small plastic whistle… I’m guessing close to none, nada, zero – yet is has always been a safety device for outdoor enthusiasts. From plastic to gold plated for those executive bods – you can start to use the lowly whistle to attract attention to your new niche. Your clients no doubt own and carry with them a mobile phone and possibly that device is a 3G – 4G smart phone capable of using various safety apps designed for the purpose. You could as the local travel safety guru, offer a series of workshops on how to use that mobile phone to download various life‐saving applications and then you can demonstrate how to use each app. The Concordia Marketing Plan Anytime there is a world event like the Costa Concordia you will want to ride on the media coverage to promote your new niche. Events like these wake people up to the fact that travel has it’s dangers and they should be prepared. With your advice your cruise clients, despite the new safety rules and regulations, will regain their confidence in cruising. If they were concerned after the media had finished with this event they would be able to return to their love of cruising being better informed and well insured. Personal Safety and Common Sense Unfortunately when people take off travelling they seem to leave their common sense at home. Not your fault but it is your problem. If you do not convert these travellers into well protected ones, you will hear about it through their lawyer when they return. On the next page we’ll explore how you can build your new niche through online and live and local workshops. Perhaps you can start to create your slogan or mantra now. “No one leaves without it!” Or, “Travel Safe. Travel Insured!” Over to you. PUBLISHING YOUR SAFE TRAVEL GUIDE Your Safe Travel Guide can be a printed version, a few The information in your Safe Travel Guide should pages stapled together, it can be a download from your website or it can be an actual booklet if you plan on selling it too. Putting a price on it adds value and then it’s your choice whether or not to give it away to clients who book with you and especially those who purchase travel insurance. You could sell it to travellers who just want the information on staying safe when travelling. You can also, with a bit of work, produce an eBook that will play on book readers like Kindle and Nook and of course on iPads. There are eBook companies who will also pay you 70% commission on e‐books that are downloaded. So you have a choice on how to use your Safe Travel Guide – but first you need to write it. Perhaps you can co‐produce this with your travel insurance provider? Just have to ask. present true, how to survive information plus where to sit on trains, planes and automobiles and overall deliver a powerful message that personal safety is a personal thing that involves common sense. That said, a good deal of survival comes from chance and luck and also being well prepared and knowing how to send SOS messages, how to stay warm etc. There are niche markets such as adventure travel and within that heading a list of activities, each with their own brand of accidents waiting to happen. If you service a niche market then you should study which accidents are the cause of most injuries and build the prevention into your Safe Travel Guide. Once written you can go public to attract attention. There are more than a few websites like SeatGuru where you can extract safety information and use these snippets to build your own Safe Travel Guide. This well known website could be your first stop for information about flying in the best seat. The information listed under SeatGuru’s Travel Tips is shown to the right. When it comes to flying safely you can research online and look for articles written about what to do in the event of an airplane crash landing. There’s certain terminology such as ditching and there’s various ways and things to do when the aircraft ditches into the ocean or skids down a runway or evacuation chutes are deployed. Dressing for travel is another topic you should cover. Vacationers will tend to fly wearing shorts and flip‐flops and with no concern about anything that might go wrong. Most frequent flyers will know that you wear only leather soled shoes and the reason for this is that leather does not burn. Flip‐flops melt. Imagine walking through a downed and burning airplane to the exit. Or through burning debris outside the aircraft. I’ll let your imagination do the rest. Same with clothing. Lose the Lycra that will stick to skin. Best choice is jeans, also carry on a scarf and hat to keep warm when the air condition goes to “ice” as it sometimes does. No one wants to arrive at their destination with a cold. TRAIN TRAVEL ADVICE Today trains are also a target for terrorists and platforms are the target for pickpockets and worse. Your advice should include these key points: terrorists tend to bomb the front of the train for maximum impact. Perhaps the rear compartment is safer. The center of the train may prove the best area in the event of a train to train collision. If a bomb goes off in a station as the train passes then it’s anyone’s guess where the main blast will hit. Tell your clients to change passenger car / carriage if feeling concerned. Be sure to warn your clients not to stand alone at the end of a platform, especially on the subway. Often this where and when muggings take place. This shot was taken at high speed in Hong Kong many years ago. The driver thought he was in a race. The man crossing the street almost became a hood ornament! TAXI TRAVEL Jumping in and out of taxis is part of the excitement of travelling. In some countries there is little to no regulation of how well taxis are maintained. This puts your client at risk. It’s a judgement call. Advise your client to check the seat belt, the door handle, the window handle or button and make sure all things are functioning. My thoughts always go back to a pal of mine, older man, well travelled, who walked out the airport terminal in China, and hailed a taxi. When he sat in the back seat, he noticed there was no door handle. He was locked in. He was savvy to the next event and told the taxi driver to pull over. The driver said, “You rich. You pay to get out!” At which point my friend let go with a few choice words and threats North American style and the taxi driver let him out to walk back to the terminal. My pal knew how much to push back to change ownership of the situation. True story. I have travelled in taxis where the driver has shown me his gun tucked nicely under his seat. Then the driver who pulled over to have lunch whilst my flight was about to go. Ah the joys of travel. Confirm the fare before getting in. HOTEL SAFETY Hotels and resorts have their own brand of challenges and some are as simple as the power going out and others have terrorist attacks. Hotels generally print and post their evacuation information on the back of the hotel room door and also by the elevators. Statistics show that hotel room robberies happen on the 5th floor and below. Anything higher and the thief might be caught trying to escape. So in this case higher floors are the best choice. For seniors, in case of a fire, or evacuation from a high floor it is not going to be in their favour. They will be required to walk down 30 floors and quickly. Exhaustion and heart attack pending. For women travelling alone, many hotels have created women only floors with security doors and guards, too. These are key points you’ll want to advise your clients about and at the same time you can also tell them about safety devices for hotel stays. Mini smoke alarms, door wedges, flashlights and more. Since experiencing a power failure in a high rise hotel, I always pack a flashlight in my computer case. So small, so easy to purchase and pack. Could safe a life at the right moment and works as a signalling device too. CRUISE SHIP SAFETY I think we heard it all during the media coverage of the Costa Concordia event. The media took us through everything from waves crashing through windows, to robberies to rapes and even brawls. Wonderful. Whatever happened to a jolly trip across the pond or around the islands? What will you advise your clients when it comes to cruising safely? The first thing of course is to attend the emergency drills. Also to watch the safety video in their stateroom and read the information in the in‐room binder too. Next is to plan an exit route from cabin to life boat. The quickest is preferred. Most cruise ships rent out walkie‐talkies – a great device for families to stay in communication. Sure they can use their mobile phones, however in some areas of the ocean they may not work. Your family travel clients might even wish to purchase their own walkie‐talkie devices. Perhaps they can purchase them from your online store? Safety onboard a cruise ship is similar to staying in a resort or hotel. You always make sure no one is behind you when entering your stateroom at night or in the early hours. Simple common sense says, look about and check. Falling overboard can be prevented by not doing it!! Most railings around the ship are high enough to prevent someone from toppling over. Children should be on a reign attached to their parent/s. Stay inside during rough weather. Stay out of the swimming pool too. Decks can be slippery, stairs can be tricky when the ship is rocking & rolling. Once again staying safe is a matter of common sense. In bad weather when the waves are huge, stay away from the glass. If you are not sure what to expect, just go to YouTube and search for cruise ships and huge waves and you’ll be watching that screen for an hour or so! Your goal here is not to scare people away but to make them sit up and take notice of the fact that only they can take control of their personal safety when travelling and they should be highly involved and engaged in the project!! REGISTRATION WITH GOVERNMENT AGENCIES This is a must do for everyone going overseas for an extended period of time and not travelling on a mass market tour. This would refer mostly to young people taking off to Europe or India or Australia and all points elsewhere. Most government websites offer a page where a traveller can register who they are, where they live and where they are travelling to and their expected return date. Now they are on file. They can also call in by phone to the consulates around the world to ‘check in’. If anything happens enroute, the last point of contact will be known and government personnel can get involved. I can attest to the fact that the system works when a friend of mine, on an overland trip was attacked by bandits. It made the news. I called the Foreign Affairs department and they already had the news and correct details. All of which is mind boggling as my friend was not registered and where the group was attacked was in the middle of nowhere. Cruise clients should download the DeckDirector app – for instant deck plans and routes. You may wish to stock up on these safety gadgets and devices and add them to your e‐store or simply direct your clients to where they can purchase them. So, wherever your are located, you can search online for local providers of safe travel gadgets and gizmos. I’ve added TripSentry to this page as this is one of the best resources for you the travel agent and of course your client. Now they will send safety alerts right to your mobile phone. Next we have gadgets like pepper spray pens, to personal alarms and door alarms for hotels and cruise staterooms. There are smoke detectors for hotel rooms too. The solar, self winding, radio, flashlight, GPS, coffee maker (whoops just kidding about the coffee maker) is a fantastic tool. People in distress want and need access to the news. Knowing what’s going on ‘out there’ helps someone in distress make informed decisions. Mobile phone apps are a natural safety tool – knowing how to use them is another thing. Sending the wrong response could be reporting that you are OK and not requiring help. When you hold your travel safety event you can discuss all of these key points and demo the gadgets too. Well, not the pepper spray! Become a Travel Insurance & Travel Safety Specialist This self study manual will help you better understand the travel safety issues you must cover with your clients before they leave on their vacation. After reading this workbook you will be able to put together your own Safe Travel Guide that will not only show you care about your clients safety but it will also help you sell more travel insurance coverage, protecting yourself and your agency in the process. This new publication will be available from www.citc.ca or publications@citc.ca in both hardcopy and e‐book format packaged with the recording of the Travel Safety webinar. Also check with www.thetravelinstitute.com for the e‐book version and the Selling Travel store www.sellingtravel.net/store.html for both e‐book and hardcopy. “Should I stay or should I go?” If I go there will be trouble An’ if I stay it will be double So come on and let me know Should I stay or should I go? Some songs, even The Clash’s 1981 hit, have that uncanny ability to key into issues that affect our lives and often cause us to transfer the message of the song to other matters that are top‐of‐mind. And in this case, it’s ‘travel’. Travellers, who are considering a new destination experience, seem to have a hierarchy of questions that must be satisfied, assuming that the destination conforms to their budget. “What are the washrooms like?” “Will I be able to eat the food?” “What is the price of a beer?” “Is it safe?” The psychology behind the order of the questions is that if the first three are answered satisfactorily, then the traveller has somewhat committed him/herself to exploring the real possibility of going to that destination. The fourth determining factor relates to safety, and in this day and age, how many times have we been asked by clients, “Is it safe to go to….” Should I stay? In the movie Marathon Man, Dr. Christian Szell, the character played by Sir Lawrence Olivier, made the question “Is it safe” famous (and haunting), but he also made it clear that neither a ‘YES’ (it is safe) or a ‘NO’ (it is not safe), was an acceptable answer. So how do you respond to this question in the context of travel?. Let’s assume that Foreign Affairs has issued a basic travel warning for your client’s chosen destination. The basic level is “Exercise Normal Security Precautions”. The safety of the destination becomes relative to the preparedness of the traveller, which is either something they have done on their own or, with the learned guidance and coaching from a travel professional. Preparation can include pre‐travel research, reading guide books, checking travel advice from government and other sources (eg e‐travel advisories, the Weissmann Reports and so on), speaking to other travellers, checking out online traveller reviews, and paying (cautious) attention to reports from the media. As far as the media is concerned you often have to dissect their need for sound bites and sensationalism from the reality of the situation. And unfortunately, the media does not always do justice to travellers or to the country. Recently, when the problems in Kingston, Jamaica began to surface, a chief CNN correspondent introduced the topic by suggesting that all Jamaica‐bound vacationers should be seriously concerned about the violence in Kingston. In the travel industry, we know that most vacationers visit the areas from Negril over to Mo’ Bay, Ocho Rios and on to Port Antonio. We also know that travellers (and even some travel consultants) don’t look at maps and therefore by painting the entire country as unsafe, a great injustice is being done to vacationers and to the country itself. If you want an example closer to home, think of the SARS ‘crisis”, when those afflicted were for the most part, restricted to one hospital in Scarborough, Ontario, yet Canada as a whole was considered by some to be unsafe. I was in Tunisia at the time and when an Australian on my group heard that I was from Toronto, she got up and moved away from me. (It was either an anti‐SARS reaction or the fact that the Blue Jays weren’t doing too well that summer) And even Foreign Affairs reports can fall under scrutiny from time to time when disturbances in one part (or parts) of a country (Eg Thailand, Mexico, Indonesia, to name a few) result in a country‐wide alert. Did travellers still visit Thailand? Yes. For the most part they avoided Bangkok and travelled north to Chiang Mai and Issan, or South to the beaches and islands. Do people still travel to Bali? Absolutely. Safety is relative. If you ask the right questions, you will find that clients either have their own comfort criteria based on past experience or they are looking to a travel professional to impart this confidence to them. Again, we are talking about the basic travel warning here. We are not talking about travel to Afghanistan or Iraq or Sierra Leone. 1. Do your clients practice street‐proofing themselves? 2. Do they know how to walk down a sidewalk when there is no one around? 3. Do they keep minimum cash with them (with the rest locked in the hotel safe)? 4. Do they resist the urge to wear bling on the streets (displays of wealth). 5. Do they know how to recognize a travel scam before it affects them? 6. Do they have a sense of what is safe to eat and drink ? 7. Do they have the travel common sense to avoid risky activities that sound like fun on vacation, even though they have never participated in that activity before (e.g. riding a motor bike, or jumping from balcony to balcony to visit friends in different units of the motel) The question of safety really is impossible to answer without the disclaimer that “if you take normal precautions, you will be fine”. But you still need to go the extra distance to define what you mean by “taking normal precautions”, and some of the ideas, above, may help you in arriving at a definition. Should I go? If your client determines that the destination is relatively safe and that they can travel there, then they may ask you if they “should travel there”. This question is usually induced by concerns over government policy or human rights issues. Of course the ultimate decision of the traveller to travel, is theirs and theirs alone. Should you travel to North Korea now that group tours are available? Will it help the people of North Korea? I am not totally sure of the answer but if you travel to Pyongyang and other areas, it will certainly open your eyes to what is happening with the people. So if you ask me “should I go”, the answer is Yes, without any hesitation. On more than one occasion, the Dalai Lama has been asked if he supports the idea of travellers visiting Tibet. The question is usually based on the concern that conscientious travellers could be helping to legitimize government policies about which they have strong feelings. The Dalai Lama (and I am paraphrasing here) responded that it was important for travellers to witness the world for themselves; to gain first hand understanding by travelling, seeing, speaking, and then relating their experiences to others. As a responsible citizen of the world, you have to see for yourself, if you have the means to do so, and then draw your own conclusions. And of course this reasoning pertains to just about every ‘questionable’ (i.e. should I go) destination on our planet. In most cases, the “should I go” destinations that I have personally explored have resulted in some of the warmest personal moments of my travels, in terms of speaking with a family, sharing a drink in a café or a laugh in a restaurant, or chatting up a bicycle rickshaw driver and learning about his life and his dreams. There is no great revelation in saying that by talking to people—even if it is simply by body language (or smiling)—you can learn a lot and come away with very special experiences. And when it comes down to it, your exploration of a destination almost always benefits you as well as the people of the country. It can bring in needed income in Zimbabwe or Nepal or educate the people about what is happening outside of their own country, in Myanmar, or confirm that people outside of the country share their concerns, as in Tibet, or that there is hope down the road that one day the government restrictions and the media will change their tune, and tourists will once again arrive and bring business, as in Bali. Should I stay or should I go? Many years ago I told someone that I was going to Kenya for my holiday. He said that with the problems in the country at that time I should definitely reconsider…“after all, Steve, you only live once”. Yes, you only live once, and this is how I and many other travellers choose to live—by exploring as much of the planet as possible and seeing and learning about the people with whom we share it. Here’s your chance to get centre stage and strut your safety stuff. Wake a few people up as to the purpose behind travel insurance, how to stay safe and how to spot a scam. You can create an overview of your event and then pitch it to your preferred insurance provider. If they don’t get it or do not buy in, then perhaps it’s time to go to the competition. After that you can secure non travel suppliers to represent their safety devices and even the local police media spokesperson to deliver a show & tell on various scams they know about. If your head office buys into this event or perhaps your fellow home‐based agents, or members of your consortium want to join you then it’s a case of more the merrier. If you wish to keep yourself above and beyond everyone else then you can go it alone to maintain your position in the market place as the ONLY Travel Insurance and Safety Advice Specialist in town. Invite the local media to the event too and make sure you have someone video the entire event and also take still shots. Once the event is over you can upload the video to your website and also share it online through your social media accounts. There are two types of events for you to think about. One is for your leisure and group clients and the other is for your corporate accounts. Your corporate account event should have a review of insurance products that cater to senior management and business owners. This type of insurance is referred to as KRE – Kidnap, Ransom and Extortion insurance. Not all travel insurance providers offer this type of specialized coverage. If your travel insurance provider does not offer KRE then you can source online for the best coverage and commission to you. Dealing at this level would require you to certainly become the Travel Insurance & Travel Safety Specialist more than the local travel agent. This is a power sale and requires that old business attire to come out fighting. In other words leave the Hawaiian shirt behind as you need to be taken seriously. You might be discussing coverage for company heads earning over a million bucks a year. These people pay to be extracted. Start with your vacation clients. Put together your event, market it well and then capture the local travel insurance market. Chances are you will also capture more cruise and tour business too. 1.5 million people killed each year and 50 million injured It is a startling statistic. How can that many people be killed or injured each year. Fifty million, each year. Mind boggling. The next fact is that many of your clients head out on that foreign highway without coverage, or should I say without full coverage. They will duck purchasing the travel insurance you mention to them, and many times they will duck the insurance the car rental agent offers them, too. Usual response being that they, your client, have been driving for years, seen it all. Fact is, there is a not‐so‐good driver coming at them on the wrong side of the road. Too late now. From here on, use these statistics as the closing argument when your client refuses insurance of any kind. Just ask, will you be taking a taxi, going by coach, will a relative be driving etc. I know from direct experience – sitting in a taxi‐van. Suddenly I had a feeling to buckle up… I did and within seconds, as we came to an intersection a car coming from the right, my side(! ), ran the light. We skidded into the intersection to a halt and I missed a date with that car and the taxi windshield. Had that not been the result, I would have been in serious need of insurance. Big time! If you want hard copy proof on these statistics you can click on this image and download the World Health Organization publication. Sometimes a little fear based marketing will help save the lives of your clients. If that’s what it takes – you must use it. If you sell coach tours… how easy is it to escape through the back window or the skylight? Have you done it? Can you show me? Airline BDMs – truthfully, how easy is it to unlock an exit door in a fit of panic, check outside for fire and debris and then throw the door out… or, turn and place it on the row of seats? Have you done it? Can you show me? Having done this very thing as part of corporate account training program I can tell you – it ain’t as easy as the flight attendant would have you believe. If you sell a tour product what’s the protocol should a tour bus be captured, or a group of terrorists attack the hotel where my group is staying? Do you know of an exit strategy that would be launched? What does your own insurance coverage cover? Would your agency accounts know how well their clients travelling on your products are covered and protected? Do you know? Just saying… an extreme BDM knows this information and can sway business to their brand by simply mentioning how well they attend to customer safety, security and overall protection. The Art Of Selling Travel Insurance Selling travel insurance is just like painting a picture and that’s why it is an art form. As you paint this picture for your client, you’ll build on layer after layer so that finally there is a compelling story that pulls the client into your picture. It’s compelling and it’s selling. Let’s brush up on this art form! 1. Seed your desk area with insurance brochures, forms, and “You need this!” slogans. If your insurance provider can supply one or two quality posters then frame them and hang them behind you – visible to the client. 2. Always paint insurance into the conversation right at the start and after you have welcomed the client and listened to their request. 3. Here’s where you recall some of your clients who suffered a horrific situation or mention the Costa Concordia, adding “I have to be honest with you – I don’t do business with anyone who is not concerned about their personal safety – the reason for that is I have seen and heard about too many terrible outcomes and also, I’ve had clients with their lawyers in here telling me I did not mention insurance or offer any safe travel tips… so, you see, I just cannot let you leave without knowing you are fully protected. Believe me, if anything happens, you’ll be very happy having invested that money…” 4. Reach for the brochure and start selling.